AS ANY WARRIOR WILL TELL YOU; EVEN THE BEST SWORDSMAN IS ONE BAD DAY AWAY FROM A CORPSE. It’s a lesson Blademaster Jezzet Vel’urn isn’t keen to learn. Chased into the Wilds by a vengeful warlord, Jezzet makes it to the free city of Chade. But instead of sanctuary all she finds is more enemies from her past. Arbiter Thanquil Darkheart is a witch hunter for the Inquisition on a holy crusade to rid the world of heresy. He’s also something else; expendable. When the God Emperor himself gives Thanquil an impossible task, he knows he has no choice but to venture deep into the Wilds to hunt down a fallen Arbiter. The Black Thorn is a cheat, a thief, a murderer and worse. He’s best known for the killing of several Arbiters and every town in the Wilds has a WANTED poster with his name on it. Thorn knows it’s often best to lie low and let the dust settle, but some jobs pay too well to pass up. The Heresy Within can be purchased from Amazon. 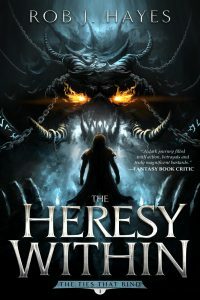 High acclaim: The Heresy Within features in Fantasy Book Critic’s top reads of 2013. See the lists at the Fantasy Book Critic website.